All these new cookery programmes have me hooked. And they seem to be having a rather strange effect on my little sister too. 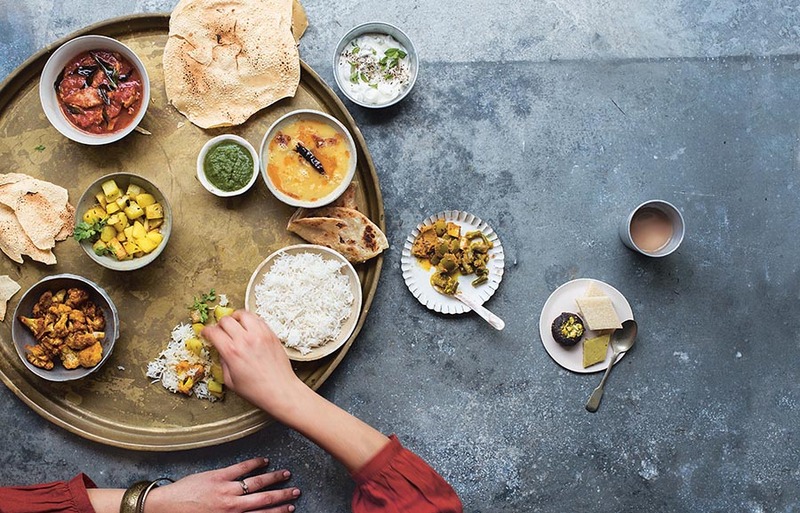 In a bold move likely to transform her life altogether, she has decided to ditch her favoured cabbage soup and salad diet in favour of quick Indian cooking. When she asked if I might teach her some easy recipes, I nearly choked and passed out. I managed a weak “of course” masking my excitement and unbelievable luck. Sadly, it’s not going to be as easy as I first thought. She has already sliced her thumb, hurt her shoulder and virtually died at the sight of one tablespoon of oil. And I’m only just getting started!! I’ve decided to “slowly, slowly catchy monkey”. I cooked the masala fish and jeera aloo in front of her and then a very simple spinach bhaji. Wish me luck! And here’s the spinach bhaji for the beginning of your own kitchen adventure. In a small frying pan, bring the oil to heat on a high flame. When it’s hot, throw in the mustard seeds, red chilli and curry leaves to make a tarka. When they start sizzling and releasing their heady aromas, take the frying pan off the fire. Put the spinach and the tarka in a microwaveable bowl. Add some salt to taste, cover and microwave on high for four minutes until the spinach is drefosted. 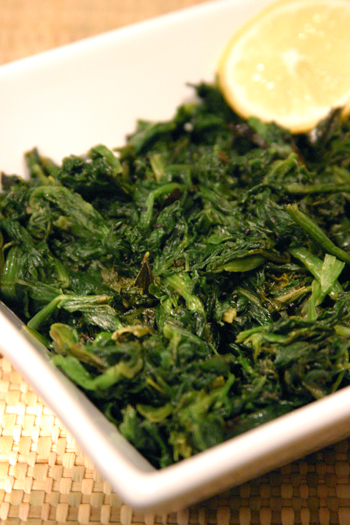 Take the bowl out of the microwave carefully and mix the spinach into the tarka. Then put it back in the microwave and heat for another minute until piping hot. To finish, stir in the lemon juice and enjoy as a side dish to your meal. Keep us informed about her improvment. So not fatty dishes for your sis then. Sis and bollywood???!!!! Who’s that girl!!???? We too have spinach a lot…love you’re microwavable version. As for all those cookery programmes, they do seem to be flooding the channels indeed…no wonder your sis is being affected. such a simple recipe.Must try.Are you sending it to srivalli’s event? Ah…the actress succumbs! about the tablespoon of oil – tell her it is to keep her (and yours too!) youthful skin smooth, supple, and glowing (no kidding). And that all important (you know why, right? 😀 ) Vitamin K, is alas, only fat soluble. I really enjoyed browsing your blog . I love Indian food but, as of now, I have not ventured myself in cooking too many indian recipes at home. Your website really makes me want to try though, so thank you! Hehe, Indian food is a great way to make lowfat tasty meals with tonnes of veggies. Good for you, glad you are inspiring the little sis. Mallika, great recipe – and so very easy. Thanks for this one. The horror at one tablespoon of oil made me laugh! It’s nice of you to teach your sister…i think she will soon fall in love with indian cooking…the spinach looks great.